!!! Immediate Action is Required !!! 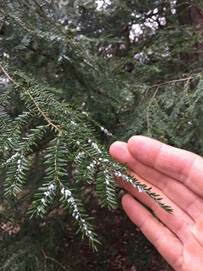 The Hemlock Wooly Adelgid (HWA) is attacking trees in Beersheba Springs RIGHT NOW. The photo to the right (taken March 2018) shows the HWA on hemlock saplings at the White house property; the HWA is seen as little white spots that look like a dusting of snow. FYI, these saplings have been removed. The HWA has decimated forests across Appalachia from Maine to Georgia. Reliable and affordable chemical treatment (Imidacloprid - pellets or soil drench) last 5 to 7 years after each application. The best time to treat is the winter months, but summer treatment can be effective if there is adequate soil moisture. Care must be taken around other blooming plants, since any insect (such as bees) visiting those plants will be negatively impacted. The goal is to save as many trees as possible until a reliable biological control is available. Many trees on private property around Beersheba were treated in 2016 by Hunt Adams, Certified Arborist, or as part of a HWA workshop lead by Nathan Hoover, Tennessee Forest Health Specialist. Properties treated by Hunt Adams in October 2016 may include: the White House, Alf Adams Cottages, Indian Rock, Beersheba Inn, Howell Cottage, Papel Cottage. Properties treated by Nathan Hoover in Nov. 2016 may include: Howell Cottage, Beersheba Library, Emmanuel, Hemlock Hall/Mazza. My Trees Have Been Treated -- What Do I Do Now? If you are sure your trees have been treated, then keep a close eye on your trees! Treated trees have a blue spray-painted mark on them. My Trees Have Not Been Treated!!! If your trees have not been treated, then TAKE ACTION IMMEDIATELY. If you do nothing, you will lose 100% of your hemlocks - guaranteed. To protect your trees, start with these four documents, provided by the Tennessee Hemlock Conservation Partnership - Tennessee Wildlife Resources Foundation. Thanks go to Carolyn Long, Hunt Adams, Susan Snow, and others for this important information.